Episode Guide, Year One, show 31. -- to the very bottom of the sea. But Nelson and Crane are unaware that Admiral Falk, the supposed inventor of the system, is a fraud, and that his ailing aid is actually the genius behind the Falk system. Stir in the fact that Falk is a bit out of his mind, and you've got the makings for an interesting outing. Go the the expanded Classic Episode treatment of "The Condemned" by clicking through here, then return to this page for the production credits and Mark and Mike's take on the episode. Mark Says: Crush-depth experiments and a two-headed sea monster make for an entertaining episode. 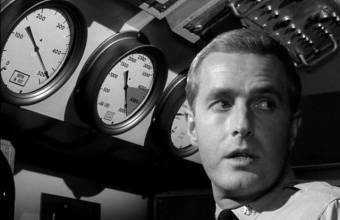 When Nelson puts Admiral Falk on the spot, demanding to know who really created the experimental atmosphere, the tension is dynamite. A good episode, although it’s never made clear why the brow-beaten Archer has allowed his work to be exploited by Falk. Mike Says: Another classic. Separately, director Leonard Horn and Writer William Read Woodfield were at the top of the heap in Voyage's year-one stable of talent, and did their very best work in this season. United for this episode, they delivered the goods and then some. Dark mood, excellent set design and top-notch film cutting unite in effect.